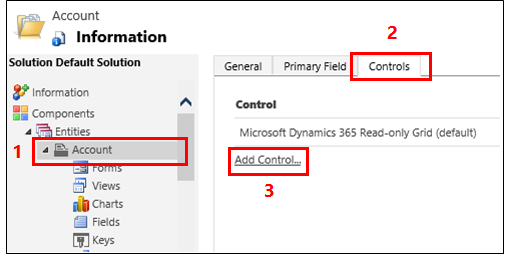 In previous releases of Dynamics 365 for Customer Engagement apps, users couldn’t enter data directly in grids (sometimes called lists) or subgrids on forms. They had to select the record in the grid to open a form, edit the data, and then save, which required multiple steps. With editable grids, users can do rich in-line editing directly from grids and sub-grids whether they’re using a web app, tablet, or phone. When editable grids are enabled through the Editable Grids custom control, users can edit most types of fields, including basic Lookup fields and option sets. In the Entities list, open the appropriate entity, select the Controls tab, and then select Add Control. In the Add Control dialog box, select Editable Grid, and then select Add. In the Editable Grid row that’s added, select the form factor(s) you want to apply the grid to. This makes the editable grid control the default control for the selected form factor(s). At runtime, users can toggle between editable grids and read-only grids. In the Available Views list, select the view to add the lookup to (for example, select My Active Accounts). 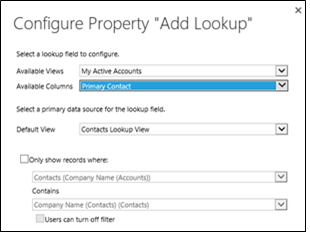 In the Available Columns list, select the lookup column to add (for example, select Primary Contact). In the Default View list, select the data source for the lookup field. If you want to limit the records displayed, select the Only show records where check box, and then select your criteria from the list, and then select OK. If you have a nested grid, select the pencil button for Nested grid view, and then select the entity and view for the nested grid. For the Nested grid parent ID select the relationship for the entities. For example, the ParentAccountID field connects the Account and Contact entities. If you don’t want to allow the user to group data by any column in the view (you want to save space, for example), in the Group by Column row, select the pencil button, and then in the Configure Property “Group by Column” dialog box, select Disabled, and then select OK. This is mostly useful for subgrids on forms. To save your work, select Save on the action bar. When you’re ready to make changes available to your team, select Publish on the action bar. To test your changes, go to the view you specified in step 5, and then make some in-line editing changes. To save an editable grid change within a subgrid, the user must explicitly save before navigating out of the form. 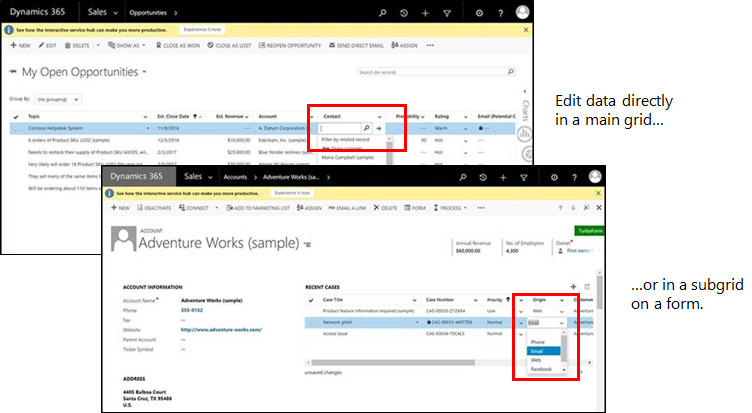 If you are using legacy forms (versions prior to Dynamics CRM 2016) and enable an editable grid on a subgrid, the editable subgrid will not be rendered. System administrators can turn off legacy forms in system settings, if needed. Open the form that contains the subgrid. Select the appropriate control, and then select Change Properties on the ribbon. 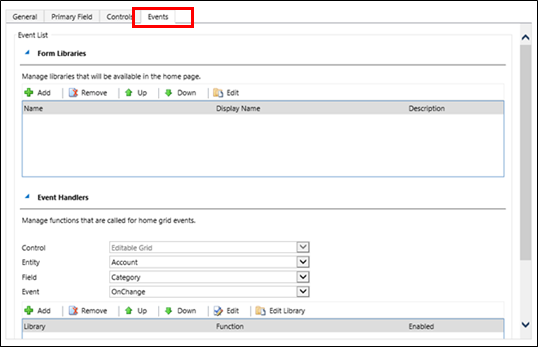 In the Set Properties dialog box, select Controls, select Add Control, and then follow the same steps listed above. The following data types aren’t editable in editable grids: Customer and Partylist Lookup fields; Composite (address) fields; State/Status fields; Lookup entity-related fields (for example, the Account entity includes a contact lookup, where the Contact field is editable but the EmailAdress(Contact) field is not editable). Question: I want to configure my look-up column to a certain view, but I don't see it in the Available Columns dropdown in the configuration? Ensure that the look-up column that you want to configure is not a "Regarding" column. This is a special column type and it does not have support for configuring the view definitions on the Editable Grid configuration dialog. Question: Why are my business rules not working for my columns? Ensure that the column where the business rule is applied on is a part of your current view. We don’t pull all the fields for an entity. But only those fields which are present in the current view. So, if your business rules are on a column which is not available, they won't run. Also note that no business rules will run in this case and not just the business rule that was applied on one column. Question: My grid is still read only even if I have configured it to be editable? Ensure that you are not using legacy Form rendering. Editable grids are not supported on legacy forms. Question: Why I don’t see editable grid on phones? Due to some recent feedback, we have removed editable grid experience from phones. In this case, you will see a read only version of a list control. We are looking to improve the experience in the future. Question: Why I cannot use record navigation in a form when coming for an editable grid? For web client, this is a limitation and we have not enabled the functionality. However, this functionality is available in Unified Interface.